It was Charles Darwin’s assumption that new species arose from previous ones by a process of natural selection. Darwin famously illustrated this point by reference to the various species of finch living on the Galapagos Islands. The problem is that the word evolution is here describing the change of species within an animal kind. This is not what we really mean by evolution when we expect to see new genetic information formed. What we have actually seen is finches changing into finches. Such variations within a kind are normal and biblically expected. This is not genuine Darwinian evolution. Thank You, Lord, that Your word is true and that all that we study in science makes sense in the light of Your word. Amen. Ref: Princeton University. (2017, November 24). New species can develop in as little as two generations, Galapagos study finds. ScienceDaily. Retrieved November 25, 2017, from http://www.sciencedaily.com/releases/2017/11/171124084320.htm. Image: Female resident finch from Daphne Major, License: Creative Commons Attribution Share-Alike 3.0 Unported. 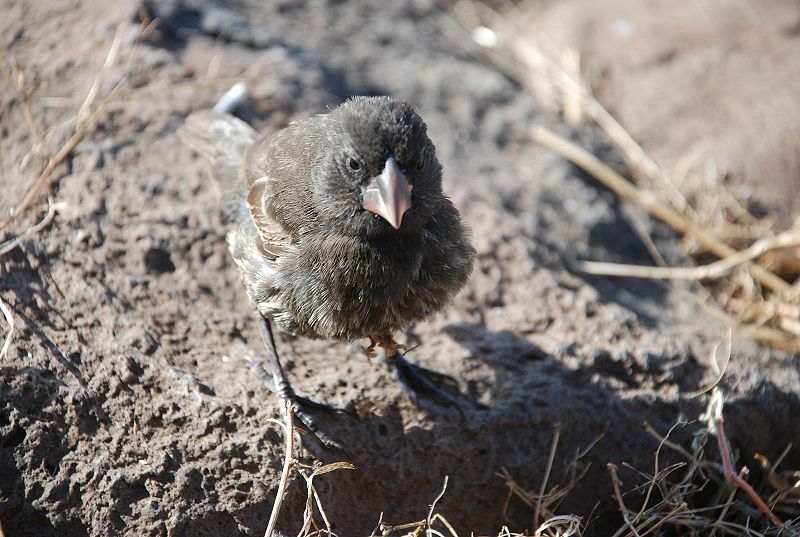 This entry was posted in Birds, Birdwatching, Christian and tagged Creation Moments, Creation vs Evolution, Daphne Major, Darwin, Finches, Galapagos Island. Bookmark the permalink.